Are you going all out this year with your Christmas lights? Need a little help decorating your yard? Could you use a little help stringing up those outdoor Christmas lights? Feeling overwhelmed & too busy to get everything done? Let us help with installing your outdoor Christmas lights and decorations! Our team of professionally trained, landscaping experts can help you turn your yard into a Christmas masterpiece! It’s what we do! We can get the job done safely, easily and quickly! Don’t risk your own safety by trying to climb tall ladders and trees! Let us handle all of the heavy lifting and the climbing so you can focus on the rest of your holiday plans and preparations. Call Us For A Free Custom Quote For Your Outdoor Christmas Lights Installation Today! Simply call us at (770) 842-5416 to speak with one of our experts (we DO answer our phones!) or fill out the contact form on the right and someone will contact you shortly. Only Hire Someone Who Is Licensed AND Insured!! As a professional landscaping business, we are licensed and insured for this type of work. Please don’t put your property or your safety at risk by trying to do this type of work yourself. And you should NEVER allow a company that is not properly and completely insured climb anything on your property! If someone were to fall out of a tree on your property (or cause a large tree or limb to fall and do damage) and they are not fully and properly insured, they can actually sue you and hold you responsible for the damage! But we can be available for other north metro Atlanta Areas for xmas light installations as well. Please call to speak with one of our team about our availability throughout the north Atlanta area. 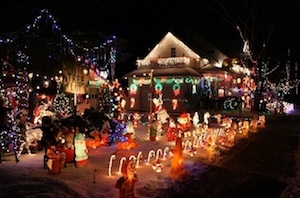 Here’s a great outdoor Christmas lights installation to get you in the spirit!